Trailhead: From park Visitor Center drive 4 miles to Highway 12, turn right and drive another 4 miles to Mossy Cave parking area on right side (west) of road (see park PDF brochure). 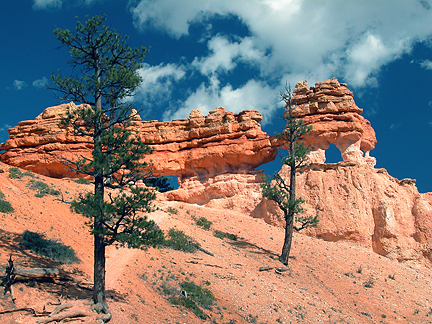 From Tropic, Utah drive about 4 miles northwest on Highway 12 to Mossy Cave parking area on left (west) side of road. From Mossy Cave parking area, hike about 1/2 mile up Water Canyon to see the arches. Also take time to visit Mossy Cave on the way.